I was dismayed recently to read of the Port of Bellingham’s new harbor lease signed with a private company to export logs and other material to worldwide destinations from the Bellingham Shipping Terminal (BST). As I understand it, the aim is to send logs and other material to China, South Korea and Japan and other markets at the discretion of the Lessee Grand Camp International LLC. The lease was signed by the three elected Port of Bellingham Commissioners and may be viewed on the Port of Bellingham website. For many years, Bellingham along with state and federal agencies have been cleaning up pollution left behind by 100 years of industrial use in and around Bellingham Bay. More background is available at the Washington Department of Ecology site. It seems odd to me to replace dirty industry with dirty industry. The deal was signed the first week of January 2017 and is already in motion. I only read about it (thanks to Students for The Salish Sea and NoisyWaters NW groups on Facebook) after it happened. In contacting the Port, I was told by the Public Affairs Administrator that “The impacts of continued shipping and industrial uses in the Log Pond and Shipping Terminal, and the associated traffic were evaluated in the Waterfront District Environmental Impact Statement (EIS) and the Waterfront District Sub-Area Plan during an eight-year public process. The GrandCamp lease is consistent with the EIS and the adopted Sub-Area plan.” I attended some Waterfront Futures meetings around 2003 or 2004 but haven’t followed local events very closely since Hurricane Katrina in 2005. There are a lot of elements which I haven’t yet read about pertaining to this lease. While the Washington State Department of Natural Resources, the Department of Ecology, and other agencies at the state, federal, and international levels are undoubtedly involved with the proposed log operation, I wonder whether all concerned parties (government agencies, individuals, NGOs and other entities) continue to examine the worrisome ramifications of this lease. I hope many efforts are underway by experts. This is sort of a prayer that they are. 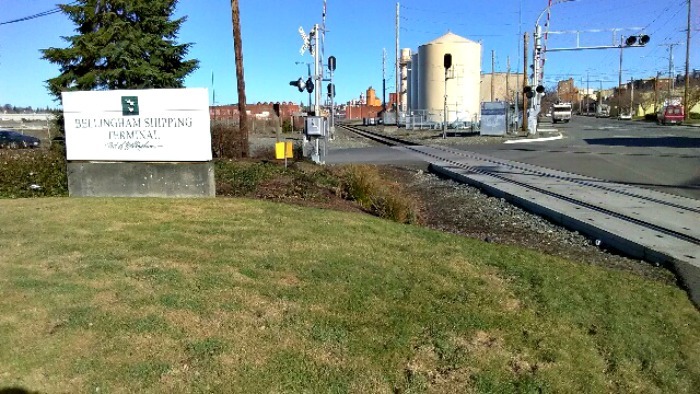 The Port of Bellingham is a county-wide "special purpose district" serving the people of Whatcom County, WA. It is in turn comprised of three districts within the County. Three Port Commissioners are elected by the people. These are elections to which I and other county citizens might pay more attention in future. There are about 75 port districts around Washington state with their significant bands of lobbyists. Considering their connection with fossil fuel and other controversies, all citizens should scrutinize such elections very carefully. A good resource on this topic might be the Sightline Institute. There has been discussion about having the Port of Bellingham be directed by five commissioners instead of three. I would be inclined to vote for five given the opportunity. The history of Bellingham is quite interesting, with its grand share of drama, speculation, booms and busts. Wikipedia has a great entry for its history. I get nostalgic like many people, but there is merit in giving up old ways when they are inappropriate. The log trucks would result in increased traffic problems on Squalicum, Roeder, and Cornwall. What is especially worrisome is the increased risk of collisions that would be catastrophic. There might be one dozen, two dozen or more trucks entering the waterfront every day. The right-hand turn into the BST seems too small of an entrance to accommodate large increases in heavy commodities. If the entrance at Pine Street along the beach is the one that will be used, it too seems to me inadequate and fraught with traffic issues. Some foreseeable risks include the tracks carrying a high frequency of BNSF oil and coal trains (each takes about three minutes to pass) along with Amtrak, the area being a blast zone in the event of oil or coal train explosions, the fact that the road is not wide or new, possible glare at sunset to prevent truck drivers from seeing trains, and the possibility that the signals don’t work in cold weather such as happened in Utah early this year when a FedEx truck was hit by an Amtrak train. Also in January 2017, two people in a pickup were killed near Spokane WA when a #BNSF train collided with their vehicle. For educational purposes, a Russian YouTube editor posted a compilation of timber truck road accidents HERE and an Italian YouTube editor has compiled train/vehicle collisions HERE. With research, I presume more academic or elite compilations could be found, but these alone are sadly illuminating. At that YouTube video recorded meeting of the Port of Bellingham Commissioners 1/3/17 an estimate was reported that over the course of two or three months, 1,200 to 1,400 truckloads of logs would arrive at BST to be stored until the next ship takes them to their various destinations. So this perhaps this means roughly a dozen or two logging trucks coming through Bellingham to the waterfront every day. For a report on the initial negotiations, which started over fifteen months ago, see the Nov 30, 2015 article in the Bellingham Business Journal. Increased wear and tear on roads might increase harm to Squalicum Creek and Whatcom Creek as well as Bellingham Bay in general. The local, state and federal agencies have been working to improve the area for salmon runs and presumably they reviewed all aspects of the log exporting operation. As I understand it, Chinook are an endangered species and use the Squalicom. I don’t know for sure, but it is possible that removal of softwood from private land partners might also be detrimental to stream buffers that traverse those private lands. Thus, ironically, it could transpire that these activities might add pollution and reduce conservation in areas of clean-up and conservation initiatives. It would be interesting to know whether private landowners are seeking economic ways to get their land cleared in order to hand over to developers for urban development. There are a great many environmental issues having to do with shipping, e.g., invasive species on hulls and in bilge of ships which can't be good for orcas, salmon and forage fish, and eel grass etc. in the Bay and the whole Salish Sea. I am sympathetic to our sister/fellow earthlings and wish that earth-friendly industries rather than log exporting would be installed at the Port of Bellingham. Wikipedia has a comprehensive entry describing the Environmental Impact of Shipping. I haven’t yet found out what companies own the ships or any particulars on Grand Camp International LLC. In Bellingham Bay, big ships are not that abundant or common now. I see one freighter moored in the Bay at the moment. Historically there were ships carrying logs and other items. There were a few recent, notable, ocean-going visitors. A few years back, an abandoned crew sat for a long time in their ship unable to go anywhere. Several years ago I saw a big moored ship with liquid being sent over the sides - it could have been clean water but I doubt it. Another time I remember a couple of big ships moored out in the bay that were giving off a strong oil or gas smell for an extended period. Then there was the Horizon Lines ship that drifted away from the pier during windy weather one time. It was in condemnable condition but was tied at a BST pier for years (its owner did pay $1,000/month in moorage fees). It was about a 20,000-ton ship (see article about the ship at the WWU student publication “Western Front”). Ships that come for logs (and possibly other material such as bark, chips, scrap, and waste) under this new lease will be about 28-38,000 tons per the YouTube video recorded meeting of the Port of Bellingham Commissioners 1/3/17. It was mentioned that there is a possibility of other barge-loads of logs arriving at the BST from various parts of North America in order to be loaded on board the next available ship. Naturally more and more barges and ships increases fouling of the waters and the likelihood of ship strikes killing orcas and others. There are ports in Washington state such as Grays Harbor that still export logs, but the Port of Bellingham is smaller and could conceivably be cleaner with better habitat than others at the present time. It would make sense to build on the great improvements that have so far been made with respect to toxics removal, pollution prevention and habitat enhancements. Moreover, cleanliness and green projects would attract additional clean businesses to move in. One of the Commissioners even said that improving the Bellingham Shipping Terminal has for 14 years been a minority position among the electorate. Although skeptical, I am not knowledgeable whether the lease is a money-maker for the region. The figures include $300,000 rental for a five-year-lease, with an option to renew. The Port and associated entities have spent around $3 million lately on the make-over of the BST, including dredging the Whatcom estuary to make way for big ships. I don’t know how cost-benefit ratios are worked out, but at least one skeptical business person attended the 1/24/17 meeting so with luck the economic discussion will continue (even though the lease is in effect). There were earlier public comments but I haven't watched the 2016 YouTube videos of Commission meetings or scoured the Port's website. Per one of the Commissioners, there were seven or eight deals that were turned down. I am aware of some of the modern businesses, e.g., solar panel manufacturing, starting up under the Port’s jurisdiction so would have expected similar enterprises to be approved more readily than log exporting. I wonder if the debarking (removing bark from wood, not removing vocal cords from dogs) that will be done onsite has its own permitting, business license(s), and other protocols? The officials said bark will be trucked out from the BST (therefore more truck traffic?). It was said that the Chinese importers don't want bark so their logs would be debarked at the BST and the bark trucked out to wherever they go. In response to a request for information, a Marine Terminals Manager informed me 2/2/17 that "The ultimate destination and use of the bark generated on Port property will be determined by GrandCamp." GrandCamp as far as I can tell at this point is just one person, Steven Grandorff. I don’t know all the uses for the imported logs after they get to their destinations. Maybe for energy instead of coal. Maybe for something else. Some people have mentioned it is bad to facilitate burning of wood for fuel in Asia as it would drift back over to North America as air pollution. There are forestry divisions in Canada and the USA that regulate and supervise imports/exports - and transportation safety boards and so on - but with the new President, there might be hiccups. Also, with ship workers of various nationalities and ships registered under various nations, political inconveniences might jam or delay arrivals and departures at both the piers and the roads. With respect to safety, for an interesting photo and story of the Maritime Friendship crane collapse (involving logs) in New Zealand a decade ago, click this NZ government link HERE. The El Faro is a tragic example of a big (container) ship heading straight into a hurricane with the resultant loss of 33 lives on 10/1/2015 perhaps due to exigencies of management. Authorities investigating may never officially arrive at that conclusion. An update was contained in this 2016 article by Reuters, but there are important posts/groups on Facebook and in the press 1/26/17 relevant to families and others close to the situation. Some people mention how many generations their family has been around, implying perhaps that this makes their input more valuable than someone with fewer ancestors or relatives in the picture. With the exception of reference to ancestors who signed on behalf of First Nations, it doesn’t seem logical to me to engage in generational hubris. Bellingham was named after an Irish-born British man who never visited the area. Some people relate that arriving at a public meeting as a result of a phone tree is a bad thing, as opposed to being aware of Port meetings by some other means. There is nothing wrong with phone trees, Facebook group notices, or Morse Code if one chooses as long as the public is alerted. As perhaps a low priority to officials and businesses, but as an important "aside" to earth-friendly enthusiasts, it is perhaps well-known that some officials in the USA are fond of hiring agencies and businesses - sometimes referred to as “wildlife services” - to kill seagulls, pigeons, starlings, bats, terns, geese and other wildlife whom they feel impinge on the success of the human population. Whatever efforts have been deployed by the City, County or others to dispatch non-human "intruders" before now might be expected to be intensified with this new lease and other leases envisioned by the Port. So while it is not that germane to this discussion regarding economic development of the waterfront, it is rather counter to the Port's partnering agencies' attempts to restore habitat and it is highly germane for some of us going forward. EcoWatch.org is one source on this topic. In addition, there will be public access areas in the vicinity meaning people will leave garbage and feed seagulls etc. which will invite more critters while nobody will tell them not to even though it is against the law to litter and feed wildlife. There will only be signs saying it is against the law to not pick up after one's dog. Adverse human practices will attract more wildlife while services will be contracted to kill wildlife. Some people reason that because of a person’s expertise acquired through decades in forestry (or seafaring, trucking, fishing, oil and gas, or other field under discussion) choosing to install a new business in this line of work would be more rewarding than something else. It’s somewhat smilar to the argument someone might put forth that they have been texting and driving for years and it hasn’t resulted in a crash therefore it won’t result in one now. I applaud whoever might be successfully engaging the Port and other relevant authorities along the lines of thought I have touched on above.